Our modern lives are busy and we’re pretty justified in our feelings that we need the latest tech and gadgets to make things more convenient. But while we type out a wishlist to Santa that’s theoretically as long as our path to retirement we should take a moment to wonder: are we really as busy as Santa himself? He’s making lists and checking them twice, he goes to a lot of effort to find out if we’re being naughty or nice. He has to come all the way to town. And not just one town, either. All the towns. And the villages. And the cities. If anyone deserves some tech to make life their life easier it’s good ol’ Saint Nick. And we think we know exactly what he'd like. 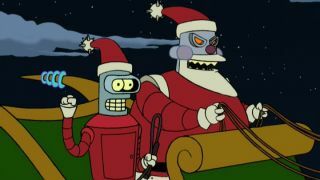 If Amazon can justify an army of drones for dropping off packages to its customers we think Santa should get some too. In fact, he should get more considering his delivery route is larger and he only has one distribution center (which, by the way, is incredibly inconveniently placed). Just think, if Santa could program some drones to lift gifts from his sleigh and deliver presents to an entire street in one fell swoop he would save a lot of time and effort trying to squeeze down those narrow chimneys. Even better, once they’ve delivered the gifts, the drones can pick up the cookies and carrots on their way out. These are the best drones we think he could get. Look, we can’t pretend Rudolph is going to be around forever so Santa is really going to need to consider some kind of tech solution for guiding his sleigh at night. They’re wonderfully talented, but Santa is finding that the elves aren’t as great or speedy at detailing plastic as they need to be. To make matters worse he’s heard whispers of unionizing. What’s a jovial foreman to do? Purchase an army of 3D printers, of course. 3D printing technology has come a long way over the years and though the machines are still expensive, they’re now suitable for home use and we have a sneaking suspicion Santa’s workshop is big enough. These are the best 3D printers for him to choose from. No, we don't mean paracetamol though we imagine that wouldn't go too far wrong either. Look, handwriting lists might have a traditionalist appeal but for convenience Santa really should consider a tablet and Google Keep. Not only will he be able to set up separate, color-coded naughty and nice lists in one easy-to-edit place, he’ll reduce the amount of paper he’s wasting. If anyone wants to stop the North Pole melting it should be him. If we had to suggest a tablet, it'd be the Samsung Galaxy Tab S2. It's light, affordable, and it features that all important MicroSD slot to expand storage – those lists will be long. It can’t be easy trying to remember your way around the entire world as well as re-learning those ever-changing flight plans every year so we think Santa should consider investing in a high-quality sat nav system. On top of its high-quality maps, the Garmin Nuvicam has voice recognition, hands-free calls and a dash cam to keep an eye on reindeer performance. Besides, sleigh insurance isn’t cheap and this should reduce it, if only slightly. You thought your dogs were hard to keep track of? Try having eight reindeer with the ability to fly. Rounding up the crew before the big flight every year must be a nightmare – Dasher was named appropriately – so Santa definitely needs to invest in a GPS pet tracker. Naturally, we've rounded up some of the best trackers around and they boast neat features like live-tracking and 24 hour location updates. Long flights on a plane are boring and noisy at the best of times so imagine if the plane was top-down and there was no in-flight entertainment or snacks to break up the monotony. Santa definitely went for style over comfort when he selected the sleigh. Still, a good pair of over-ear wireless headphones that will allow him to listen to his favorite podcast or album should offer some comfort. It’s one of his most iconic features but sometimes Santa gets self-conscious about his Christmas bauble belly. He’s not looking for a Chris Pratt transformation, just a little bit of definition. There's a fine line between being a ballast and an anchor. We think a fitness tracker might help and these are the best fitness trackers around. By December 2017 he'll be hopping from rooftop to rooftop. Sometimes Mrs Claus likes to check in, and Santa’s phone battery isn’t the greatest. To make matters worse he’s developed a penchant for Pokemon Go. We think a portable charger could reduce his woes. These are the most powerful portable batteries he can buy. With our help, Christmas 2017 should be Santa's easiest yet.